Today I kicked out a new release of Lernid – Lernid 0.3. 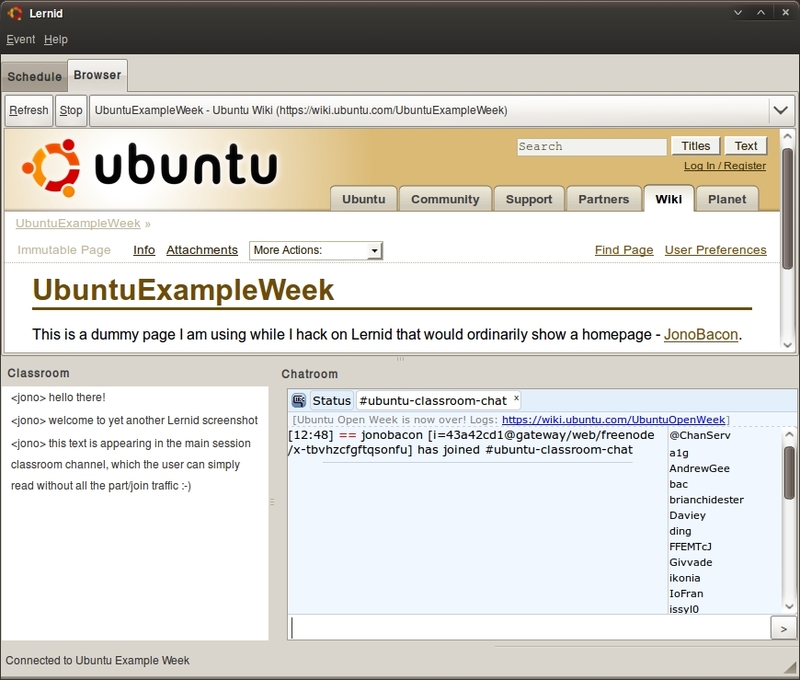 This release packs in some juicy new features and bug fixes, and we are edging closer to Lernid 1.0 ready for our next major learning event: Ubuntu Developer Week. Refined Interface – the interface has been re-factored to make better use of space and work better on smaller-resolution screens such as netbooks. Schedule View – Lernid now has support for real events. Events are specified using an iCal feed: this means that any calendaring application can be used to create and publish events. Events are now displayed in a special schedule view, in chronological order. Notifications – 10 minutes before an event begins Lernid will pop up a nice little notification bubble to remind you that an event is about to start. No more missing those rocking events! Improved Browser Feature – Lernid has a built in web browser in which sites relevant to the session can appear. Switching between sites is devilishly simple, and we now have Reload and Stop buttons. Automatic Website Loading Triggered By Session Leaders – a useful new feature I added today ready for this release adds a listener for web addresses in the main classroom session. This means that when the session leader mentions a web address, it will automatically show in the browser pane. This offers a first-of-its-kind feature for our learning weeks in which content can be delivered to attendees automatically without them having to do or type anything, right from inside Lernid. Other listening features are planned in future releases. Translations Support – we now have translations support fully built into Lernid, with available translations in Arabic, Asturian, Brazilian Portuguese, Catalan, Chinese (Simplified), Czech, Danish, Dutch, English (Australia), English (Canada), English (United Kingdom), Esperanto, Filipino, Finnish, French, German, Hebrew, Hungarian, Indonesian, Italian, Lojban, Malay, Polish, Portuguese, Romanian, Russian, Slovenian, Spanish, Swedish, and Telugu. Thanks to our awesome translations community for all their hard work! Thanks to David Planella, Lucian Adrian Grijincu, and Andrew Higginson for contributions to this release. Also, Lernid is built using the Quickly framework, and if it were not for this awesome tool, I doubt I would have ever started hacking on Lernid. If you have ideas for cool desktop applications and have an affinity with Python, you should give it a whirl. More information about Quickly and links to the always wonderful Didier Roche’s tutorial is here. This will deliver each new release of Lernid directly to your desktop in Update Manager updates.